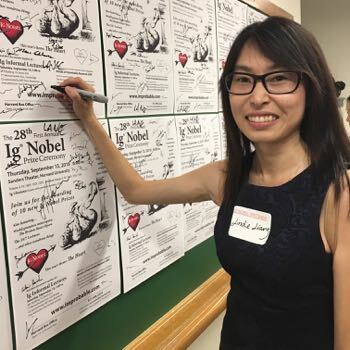 Waterloo – Wilfrid Laurier University Assistant Professor Lindie Liang and her fellow researchers have been awarded an Ig Nobel Prize for their research, which used voodoo dolls to explore how and why employees retaliate against abusive supervisors. The prize, announced Sept. 13 at Harvard University, was presented by science humour magazine Annals of Improbable Research. The magazine awards 10 prizes annually to celebrate unusual, imaginative and funny research from around the world that “makes people laugh, and then think.” Several Nobel laureates were on hand to deliver the awards to the winners. While the Ig Nobel awards are described as “celebrating the unusual and honouring the imaginative,” their stated purpose is also to spur people's interest in science, medicine, and technology. Past winners have included a pair of physicists from the University of Manchester and the University of Bristol who successfully suspended a frog midair using magnets; an ecology professor from the University of Florida who wrote a book to help drivers identify the bug splatters on their windshields; and chemists from the University of Minnesota and University of Wisconsin who studied if humans would swim faster or slower in syrup rather than water (they swam about the same speed in both). In their study, “Righting a wrong: Retaliation on a voodoo doll symbolizing an abusive supervisor restores justice," published in the February issue of Leadership Quarterly, Liang and fellow researchers asked participants to recall an abusive workplace interaction. Some were asked to harm an online voodoo doll using the materials provided (pins, pliers, etc. ), while others weren’t given that option. Those who hurt the voodoo doll felt a greater sense of justice than those who did not. Still, Liang is hesitant to recommend that people use voodoo dolls. Liang is currently studying other methods employees can use to better respond to mistreatment by their supervisors, including mindfulness training and shifting their perception of situations. She is also studying the potential of workplace gossip to prevent supervisors from abusing their employees. Read the news release about Liang’s research. See past winners of the Ig Nobel Prize.